Using a systems perspective, this updated version concentrates on the planning, scheduling and control factors of a project needed to bring it in on time and on or under cost. This edition contains expanded coverage of computer simulation and applications, information management and expert systems in project management. Includes a new chapter on Total Quality Management. 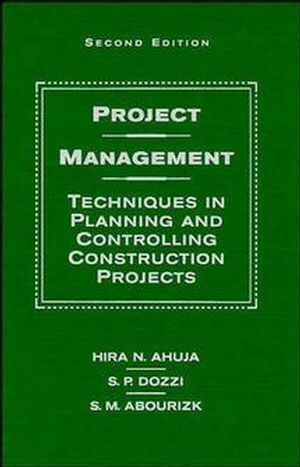 Hira N. Ahuja and S. P. Dozzi are the authors of Project Management: Techniques in Planning and Controlling Construction Projects, 2nd Edition, published by Wiley. CPM: Activity on Arrow (AOA). Planning Methods, Tools, and Procedures. Determination of Most Economical Project Duration. Plan Implementation, Monitoring, and Control. An Introduction to Systems Simulation. Total Quality Management of Projects.